Remove steering column lower cover. Refer to IP-16, "Removal and Installation". 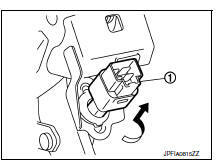 Disconnect the harness connectors from the brake pedal position switch (if equipped) and the stop lamp switch. Rotate the stop lamp switch and the brake pedal position switch (if equipped) (1) counter clockwise to remove. Disconnect the accelerator pedal harness connector and harness clip. Remove snap pin and clevis pin from clevis on brake booster. Remove the brake pedal assembly. Secure the brake booster and brake master cylinder to avoid damage to components. Remove accelerator pedal from brake pedal assembly. Refer to ACC-3, "Removal and Installation". 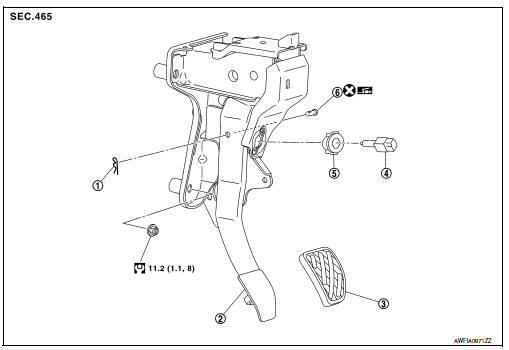 Check for the following items and replace the brake pedal assembly, if necessary. 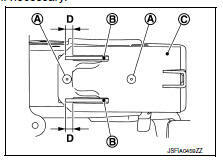 Check the brake pedal upper rivet (A) for damage or wear. Check the brake pedal for bend, damage, and cracks on the welded parts. Check the lapping length (D) of sub-bracket (B) and slide plate (C). Do not reuse the clevis pin. Install the clevis pin in the proper direction. Refer to BR-22, "Exploded View". Apply multi-purpose grease to the clevis pin and the mating faces, if necessary. 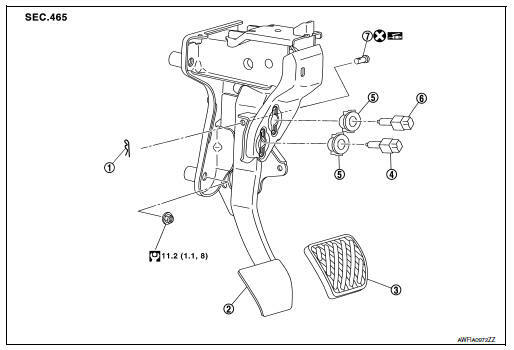 Adjust each item of brake pedal after installing the brake pedal assembly to the vehicle. Refer to BR-15, "Adjustment". Perform the release position learning of the accelerator pedal. Refer to EC-138, "Work Procedure".